The testimony came at Abu Ghaith’s trial on charges he conspired to kill Americans and aid al-Qaida as a spokesman for the terrorist group. NEW YORK — In surprise testimony in a Manhattan courtroom Wednesday, Osama bin Laden’s son-in-law recounted the night of the Sept. 11 attacks, when the al-Qaida leader sent a messenger to drive him into a mountainous area for a meeting inside a cave in Afghanistan. “Did you learn what happened? We are the ones who did it,” the son-in-law, Sulaiman Abu Ghaith, recalled bin Laden telling him. 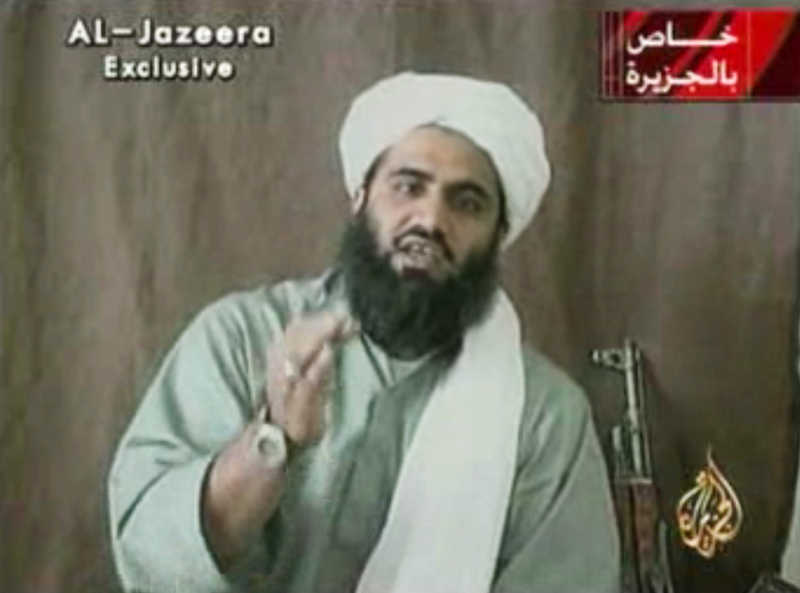 The Associated Press This image made from video provided by by Al-Jazeera shows Sulaiman Abu Ghaith, Osama bin Laden’s son-in-law and spokesman. Abu Ghaith took the witness stand on his own behalf Wednesday. When bin Laden asked what he thought would happen next, Abu Ghaith testified that he responded by predicting America “will not settle until it until it kills you and topples the state of Taliban,” he said. Bin Laden then told the onetime imam, “I want to deliver a message to the world. … I want you to deliver the message,” he said. The testimony came at Abu Ghaith’s trial on charges he conspired to kill Americans and aid al-Qaida as a spokesman for the terrorist group. His decision to take the witness stand was announced by his lawyer, Stanley Cohen, who surprised a nearly empty courtroom that quickly filled with spectators as word spread. He said he met bin Laden when the al-Qaida leader, who was living in Kandahar, Afghanistan, summoned him after hearing that he was a preacher from Kuwait. Abu Ghaith said bin Laden explained that the al-Qaida training camps involved so much weapons training and a rough, hard life that he wanted him to change that, to reach the hearts of recruits and show them another side of life. The defendant testified that videos he made warning that there would be more attacks on Americans and trying to inspire others to join al-Qaida’s cause were based on “quotes and points by Sheik Osama,” including at threat in one video that “the storm of airplanes will not abate.” He also denied allegations by the government that he had prior knowledge of the failed shoe-bomb airline attack by Richard Reid in December 2001. He testified that his videotaped sermons were religious in nature, and meant to encourage against Muslims to fight oppression. If “oppression befalls … any category of people, that category of people must revolt,” he said. Abu Ghaith is married to bin Laden’s eldest daughter, Fatima. According to Cohen, they were married in 2008 or 2009. The defendant looked relaxed on the witness stand, wearing a blue shirt, open at the collar, beneath a charcoal-colored jacket. The announcement that he would testify energized jurors, who looked around the courtroom as it filled with representatives of the prosecutor’s office and others. Some of them leaned forward in their chairs as Abu Ghaith spoke. The testimony comes two days into a defense presentation that followed seven days of exhibits from prosecutors.